the needs of its membership and promote excellence and exemplary practice within the profession. the authoritative standard for professional home inspection. Since 1976, ASHI has worked to build consumer awareness of home inspection and to enhance the professionalism of its membership. The ASHI Standards of Practice and Code of Ethics serve as performance guidelines for home inspectors, and are universally recognized and accepted by many professional and governmental bodies. The American Society of Home Inspectors (ASHI) publishes a Standards of Practice and Code of Ethics that outlines what you should expect to be covered in your home inspection report. Massachusetts mandates that home inspectors to be licensed and many inspectors are satisfied to stop at that milestone. Not all Massachusetts inspectors are ASHI Inspectors. ASHI Inspectors go beyond the state licensing requirements. 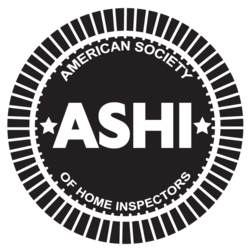 To become an ASHI inspector, the inspector must pass the Nation Home Inspectors exam, provide randomly selected written reports for audit by ASHI and agree to and comply with the ASHI Standards of Practice and Code of Ethics. An ASHI inspector is obligated to obtain continuing educational credits. Staying current is paramount for an inspector to learn new building materials and techniques. Being an ASHI inspector gives the client more confidence in the experience and qualifications of the home inspector. They have met the objective standards of the Commonwealth of Massachusetts, in addition to being accepted by their peers as an outstanding inspector. Only an ASHI inspector can provide their customers with a professional, personalized inspection that combines more than 30 years of the highest technical standards, adherence to a strict code of ethics and the very best in customer service and education. We call this “The ASHI Experience”. When you choose ASHI, you’ll be working with a professional home inspectors who have passed the most rigorous technical examinations in effect today. No other professional society can match the credentials of an ASHI inspector. ASHI Certified Inspectors have reached the highest level of ASHI Membership. ASHI Certified Inspector members know houses. They are trained to objectively communicate to you, the home buyer, what the house has to say. ASHI Certified Inspectors have demonstrated technical proficiency and report-writing skills, and are committed to continuing education in order to achieve and maintain their ACI status. ASHI Certified Inspectors are committed to conducting inspections in accordance with the ASHI Standards of Practice and Code of Ethics, and are dedicated to providing superior customer service. ASHI Certified Inspectors are the only true 3rd part certified inspectors in the industry that are accredited by the National Commission for Certifying Agencies(NCCA). ASHI Certified Inspectors deliver more than a home inspection, they deliver "The GOLD Standard".